And still news of price reductions continues to come in as a call to Nigel Wales at Arrival Yachts confirms a price drop on his central listing, the 35.46m flybridge motor yacht Activa Club. Built to RINA class by Azimut in 2006, she's one of the yard's popular 116 series and has a modern interior in satin finished cherrywood. 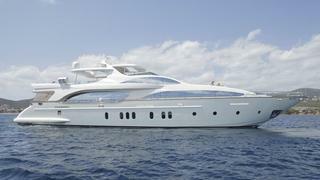 Activa Club can sleep up to 14 guests in five principal staterooms and a convertible media room on the main deck. Currently lying in Palma, she's commercially registered under the Spanish flag. Activa Club is now asking €5.45 million, down from €5.95 million.